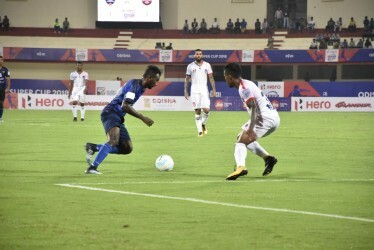 The striker scored in the latter part of each half..
Gokulam Kerala FC secured a well-fought 2-0 victory over NorthEast United FC in the second qualifier of the Hero Super Cup on Thursday at the Kalinga Stadium in Bhubaneswar. Gokulam’s Henry Kisekka scored an impressive brace which ensured his team made it through to the next phase of the tournament. 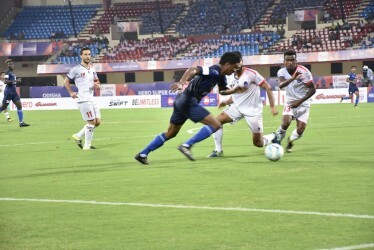 The match began with Gokulam on the front foot, stringing passes and creating chances to test NorthEast’s defence. Kisekka kept thronging the opponent’s box even though the Highlanders kept early possession. In the 12th minute, NorthEast thought they had taken the lead but Lalrindika Ralte’s goal was ruled out as an offside. Gokulam replied by creating a chance of their own minutes later, but Kisekka failed to convert from close-range. On the other end, Marcinho had a chance to score when he jumped to head in Danilo Cezario’s cross but eventually headed it wide. Halicharan Narzary had the best chance of the half when he found himself in a one-on-one situation with Gokulam custodian Nikhil Barnard, but his indecision wasted the opportunity. The 34th minute saw Kisekka trying to lob the ball over NorthEast’s keeper TP Rehenesh, who was caught off his line but it just went over the bar. Kisekka, however, made no mistake some minutes later, when he opened the scoring for Gokulam with his sweet strike from the right edge of the box. Gokulam almost got a second at the stroke of half-time when Provat Lakra sent a stunning shot at goal from distance but it hit the crossbar. With the one-goal advantage, Gokulam entered the breather as the happier of the two sides. NorthEast started the second period in control of the game and in search of the equaliser. They came out all guns blazing to keep pressuring Gokulam’s defence, but Barnard held his composure to thwart their attempts. Twenty minutes into the half, the Highlanders made two attacking substitutions, introducing Seiminlen Doungel and Maic Sema into the mix. However, that didn’t help NorthEast as Gokulam managed to take a double lead by the 75th minute, thanks to Kisseka again. Arjun Jayaraj ran in from the right and sent in an inch-perfect pass to Kisseka, who made no mistake in slotting the ball home. Danilo and Doungel had two glorious chances in the other end but failed to open their team’s account. Sema tried to keep NorthEast in the hunt by initiating a number of attempts on goal in the dying minute. His best chance came in added time when his shot beat Barnard but unfortunately hit the crossbar. That was the last bit of action as 90 minutes of intense play came to an end with Gokulam entering the Hero Super Cup on the back of a solid display.